Harry Stuart received his MFA at Louisiana State University. 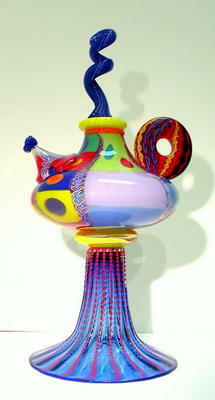 He headed North and worked with glass artists from Pennsylvania and New York. 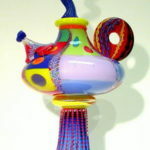 In 1987 he opened the first glass studio at the University of South Carolina. He showed his work in prestigious shows such as the Corning Museum New Glass Review and the International Exposition of Glass in France. With these successes he opened another glass studio and started production. 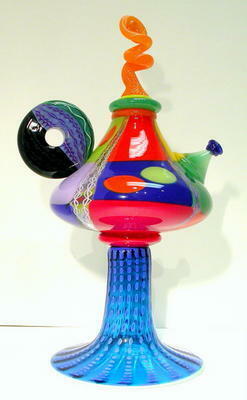 Stuart’s glass pieces are patchworks of both primary and secondary colors, both opaque and transparent glass. He creates such pieces by making what he calls a ‘drawing’ by laying shards of glass onto a metal plate, heating them to 1000 degrees F which allows the pieces to mold together. He then gathers a mass of molten glass on the end of a long, steel blow pipe and rolls it over the ‘drawing’ which adheres. He reheats it again to 2000F and encases the entire piece in crystal and then shapes it.